The Municipality of Gjakova has signed a contract with DVM Blendi Bejdoni on 16th June 2015 and started in August a CNVR program. The Municipality supported this action with a substantial investment. For the estimated over thousand stray dogs in this city the promised sum will not be enough, so our foundation pays part of the costs. In two months 133 dogs were already castrated and treated. By the end of the year 2015 357 dogs have been treated. Since August 2016 the municipality has no budget for the stray dogs, so we had to take over and are again depending on donations. Help this town to continue the CNVR program. The town has a no kill policy, so stray dogs have a chance to survive, once treated and castrated. By the end of 2016 we had 800 dogs treated. And the Veterinary Inspector of the town controls our work. Until May 2018 we are regularly working with stray dogs in this municipality and the villages of this region. Then the state program for stray dog starts. Already beforehand we started information campaigns and to propose free treatment and sterilisation of owned dogs. The people in Kosovo are often too poor to afford the treatment of their dogs - so we help and prevent the dumping of sick and old dogs as well as puppies in the streets. Our Foundation together with our Pro Vet Team will open end of october 2018 a Transitory Care Center (TCC) for dogs. In cooperation with our own NGO in Kosovo, "Kosovo Small Animal Welfare" also cats will be treated. The TCC has a small Sanctuary, you can visit any time - and adopt a dog from us. 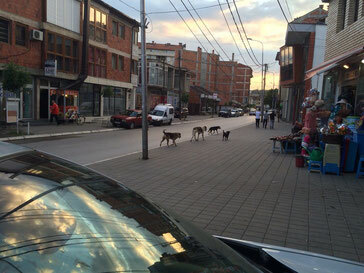 Stray dogs in the Municipality of Gjakova.